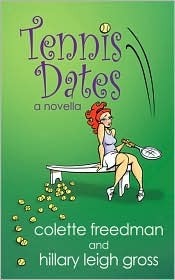 Tennis Dates - Colette Freedman is a top Hollywood Script Doctor who has also ghost written several novels. Nora is at an an impasse in her life, professionally and romantically. With help from her zany friend Phoebe, Nora enters the world of Internet dating where she meets her perspective dates on the tennis court. But can she excel in a game where love equals zero?